It’s apparent that the new Ferrari P80/C is unequivocally gorgeous, but the other day someone pointed out that it looks familiar. Specifically, that it looks like the fictional Vapid FMJ from Grand Theft Auto V. Now I can’t unsee the similarities. We’d be remiss to point out that games like the Grand Theft Auto series have been ripping off real cars for a long time now. The Banshee, for instance, looks pretty spot on for a Viper, the Infernus, a Lamborghini. But does the Ferrari P80/C take that equation and flip it around? I wouldn’t go quite as far as Mr. Banovsky here and call the Ferrari a “ripoff,” but I mean, it certainly looks like the look of the video game car had some serious influence on the P80/C design. Maybe it was subconscious, but it’s definitely there. Especially from front three-quarter angle. The Vapid FMJ was released as part of the “Further Adventures in Finance and Felony” download for GTA Online on June 7, 2016, according to the GTA Wiki. 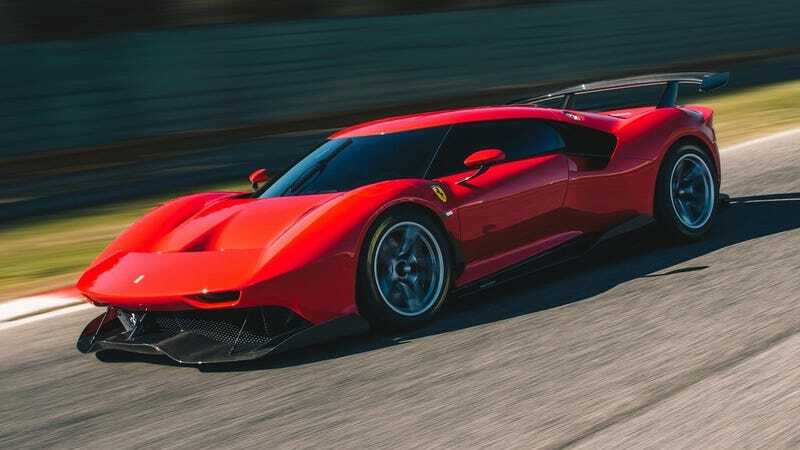 The Ferrari made its world debut this week, though the company stated development of the P80/C began in 2015 and was “inspired by iconic models from Ferrari’s history: the 330 P3/P4 on the one hand and the 1966 Dino 206 S on the other,” per its official announcement. So, maybe the FMJ is actually a ripoff of the real car! It’s certainly possible, in this crazy universe, that a game designer might have somehow seen an early design sketch. When I was a kid, there is nothing I wanted more in this world than the “Ramon” from MegaRace to be real. Some people just have the means to make things like that happen. The GTA Wiki describes the Vapid FMJ as a mashup of the Ford GT and Aston Martin Vulcan; all cars in the GTA games are officially considered parodies and/or unlicensed original creations. But now that I’ve seen the resemblance between the P80/C and the FMJ, the two cars seem more similar every time I look. Tell me I’m not nuts here–Banovsky and I aren’t the only ones who see this, right?